What do we owe Iraq? America is up to its neck in nation building--but the public debate, focused on getting the troops home, devotes little attention to why we are building a new Iraqi nation, what success would look like, or what principles should guide us. 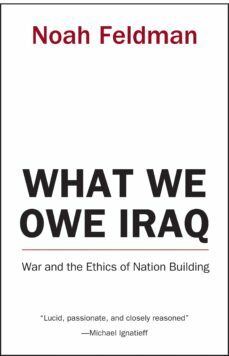 What We Owe Iraq sets out to shift the terms of the debate, acknowledging that we are nation building to protect ourselves while demanding that we put the interests of the people being governed--whether in Iraq, Afghanistan, Kosovo, or elsewhere--ahead of our own when we exercise power over them. Noah Feldman argues that to prevent nation building from turning into a paternalistic, colonialist charade, we urgently need a new, humbler approach. Nation builders should focus on providing security, without arrogantly claiming any special expertise in how successful nation-states should be made. Drawing on his personal experiences in Iraq as a constitutional adviser, Feldman offers enduring insights into the power dynamics between the American occupiers and the Iraqis, and tackles issues such as Iraqi elections, the prospect of successful democratization, and the way home. Elections do not end the occupiers responsibility. Unless asked to leave, we must resist the temptation of a military pullout before a legitimately elected government can maintain order and govern effectively. But elections that create a legitimate democracy are also the only way a nation builder can put itself out of business and--eventually--send its troops home.Feldmans new afterword brings the Iraq story up-to-date since the books original publication in 2004, and asks whether the United States has acted ethically in pushing the political process in Iraq while failing to control the security situation; it also revisits the question of when, and how, to withdraw.